My friends, Don and Sally Wilson, were in church Sunday. They had returned from their annual winter in Phoenix, AZ. It was good to see them again after another long winter without them. Don said he had my trike and would bring it to me after noon today. Around 1:00PM I started listening for Don's big, new Chevy. I read a book as I listened. I also fell asleep. His knock awakened me. Don carried my gear into the house as I took the trike to the garage. I'm not eager to dig into the gear. Smelly, smelly! That dirty laundry has been in those bags for a couple weeks now. I bet they are truly ripe. Oh, Julie, sweetie-pie! Sally was not with Don. She was with one of their daughters who were as happy to see her parents as we were to see our friends. We have a "ladies" outing on Friday evening and I told Don to tell Sally she was invited. I wanted to take Don to lunch but he had already eaten. He said he would go for coffee and a chat. We went to Sweet Henry's for coffee and dessert. Don told me all about their trip from Phoenix to San Diego and back. It was their first trip to Southern California and they had a good time. Would you believe Don saw the same "bag lady" that I discribed in an earlier blog. Their couldn't be two such people even in a city as large as San Diego. When Sally called to tell Julie that they would go after my trike and bring it home Julie told Sally we would cover all their expenses. Whatever, it would be cheaper than me going after it from Ohio. Sally wouldn't talk about that to Julie. She just said they'd bring my trike home. When I asked Don what his expenses had been he said the truck used exactly $100 in gas. Thats easy to believe. Although it is brand new, he only gets about 17 MPG in that monster. He said the trike storage was $10 so "just make it $110" he said. What a guy! I asked about the motel. Lodging in San Diego can be expensive. Ah, he said, $110 would be plenty. I forced $210 on him against his protests telling him what a bargain it was for me. 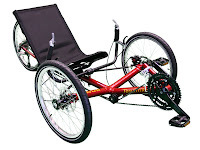 It cost me $388 to ship the trike to California. We had a pleasant chat. I look forward to sharing the good times with these friends over the summer and fall months. Don asked the "when and the who" of our next group dinner. I told him it was Julie and I in May but we didn't know when or where just yet. Obviously he was as eager to see the gang as they are to see him. but the best ships are friendships!" CHANGE WAS PROMISED: We're about to get it! STORY TELLING TIME: R e a l l y ! ! ! ! GOING DOWN THE VALLEY: Merrill and now George. A DEBT OF HONOR: An Obligation Fulfilled! LUNCHES & DINNERS: That Free Taste, yum yum!